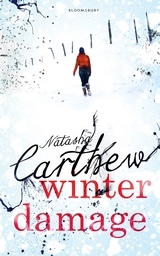 Natasha Carthew “When I started writing my first novel Winter Damage I found myself drawn to the outside countryside around me out of necessity. It was a way to clear my head and immerse myself fully with the world that my characters inhabited. “As a poet I have always written out of doors, the notebook and pencil stuffed into a pocket as I walked the cliffs and beaches of my home village as a child, something I was always used to carrying. To be engrossed in the countryside was to know inspiration was close, to be prepared and ready to write was to be lost in the moment. I love this idea of writing outdoors, but sadly get so involved at my computer screen that I rarely do it. Hours later, I pack in for the day with a headache and aching shoulders. If only I had sat in the garden, gone for a walk, broken my routine. Writing outside doesn’t have to mean being in South-East Cornwall though, it can mean sitting in your tiny back garden or on that quiet park bench. It can mean sitting outside a coffee shop, mug at your elbow, watching pedestrians pass-by. It’s a personal choice, but it can help to match your outdoor writing location to your novel. 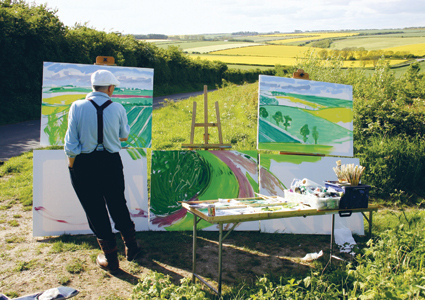 We are used to the ideas of artists painting outdoors; I can picture Van Gogh in the sunflower fields of Provence, and David Hockney [above] painting in the wide landscapes of East Yorkshire. But we don’t read about authors writing outside, do we? I wonder if many do. To read the full article with Natasha Carthew here. How you describe writing at a coffee shop is what happens to me, I people watch and write nothing. I love idea of working outside, and with my Ultrabook can go anywhere but even with a laptop, computer screens, light direction and brightness outdoors is a consideration. If inside a view to the outside at least is preferable, and beaks to make cups of tea and move around essential.